Conducting clandestine photo shoots and testing new, classified kayaks ain’t exactly James Bond glamorous. Two foam-wrapped prototype kayaks and half a dozen large boxes of accessories—some assembly was apparently going to be required—signaled the demise of any unoccupied floor space in my garage way back in June. Fearful that someone might inadvertently photograph or video the secret kayaks and post the information online, I had to slip them in and out of Hobie covers whenever transporting them in daylight. Several kayakers must have thought I was downright anti-social when I pedaled off at warp speed when they attempted to approach me on the water. And even though we shot thousands of images and terabytes of fish-catching video, we had to refrain from posting any of it online until Hobie introduced the new model to the public. The new Hobie Mirage Compass matches the standup capabilities of much bulkier boats, but is far more athletic. At first glance, her sharp entry, low gunwales and angular lines disguise a 34-inch width, and the no-nonsense kayak hull weighs in at a svelte 70 pounds. That kind of width typically condemns a paddle kayak to the slow lane. However, I had no problem hitting 5.5 mph despite the added weight of an H-Crate, four fishing rods, drink cooler, electronics battery and a typical load of fishing gear. Even more impressive, I managed 4.95 with a paddle. The lightweight boat has very impressive acceleration, right up to the point when the wide stern suddenly digs in around five knots. For anglers, the speed and stability don’t come at the expense of stealth. Pedaling into a moderate 10-knot chop, the Compass hull generated little cockpit spray; fishing the flats, hull slap was virtually nonexistent, even with the significant stern weight of a Pole-Pole Micro Anchor and loaded H-Crate lifting the bow slightly. Fishing in the Compass, my son needed just a short cast to hook and land a wary 30-inch spotted seatrout—a rare Florida panhandle catch these days—in 18 inches of water. At the same time, it admirably handled sloppy offshore and surf conditions. In terms of fishing, the performance is impressive for a boat featuring 400 pounds of capacity, outstanding stability and low center of gravity for standing or fighting big fish in deep water. Viewed from behind, the Compass obviously steals some design cues from Hobie’s aircraft carrier-shaped Pro Angler series. Rather than tapering to a point, the stern squares off at 16 inches to facilitate another PA feature, the drop-down rudder. The rudder’s forward positioning facilitates quick responses and a tight turning radius in the relatively short 12-foot hull, provided the kayaker generates a bit of forward momentum to put sufficient water pressure on the rudder prior to turning left or right. From Point A to Point B, the tri-hull bottom design and long, deep keel keep the Compass nicely on course, with minimal rudder adjustments required. A sacrificial skid plate has been added to the keel to minimize abuse from dragging the Compass. This is a kayak distilled to its essence. It is offered with the MirageDrive with Glide Technology rather than the reversing MirageDrive 180. Standard amenities consist of two molded-in rodholders behind the seat, a molded deck cupholder, two recessed H-Track gear tracks and a single 8-inch Twist-and-Seal hatch forward of the seat. Rather than a bow hatch, the Compass features a forward storage area, a 20-inch notch extending forward from the cockpit. 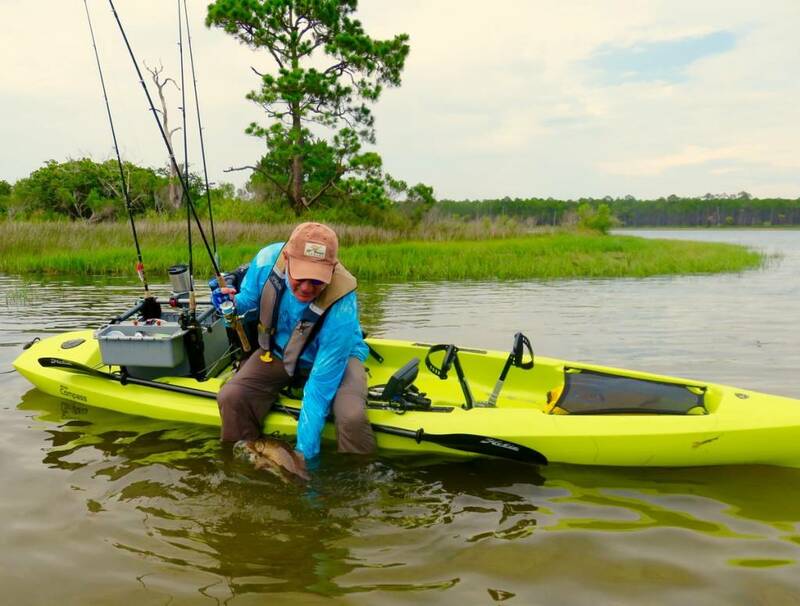 Hobie’s new 26-inch soft cooler slides nicely into that mesh-covered recess, making it much more accessible than a fish bag stashed inside the hull when bouncing around offshore. The upside to simplicity is a lot of flat deck for sight-fishing or fly line. The tankwell is 30 inches long and 22 inches wide—plenty of room for a standard crate or the new downsized H-Crate Junior, either of which holds four rods and rail attachment points for a variety of gear trays, camera mounts and cupholders. For additional storage, owners can accessorize the Compass with a waterproof bag, crate or the new seat backpack, or add the accessory EVA pad kit to add grip and dampen sound. In keeping with the simplicity theme, Hobie offers the Compass in two colors, Slate Blue or the first green kayak in company history, Sea Grass. Hobie’s designers settled on an optimal midlevel seat position. The mounting setup is interesting in its simplicity—two bungee cords lock the seat onto a raised pedestal, while two adjustable straps determine the seatback position. It is a solid, foolproof approach, and the seats didn’t squeak once in months of testing. There’s room underneath to store tackle flats. The fitted hull weight is an even 70 pounds. If you fish with a partner, the light weight, low height and carrying handles at the bow and stern make it a cinch to toss the Compass on an SUV or garage storage rack. Molded interior finger grips within the cockpit are perfect for tilting the Compass for scupper cart insertion. Compass users who fish solo might consider adding additional midship handles for easier loading. Mounting electronics, leaning posts or other accessories is a snap on the foot-long recessed H-Track. As with any non-metal track system, anglers who troll with the reel in gear should consider mounting rod holders directly to the hull. The Compass will be a welcome addition to the Hobie fleet. Quiet, lightweight, stable, fast—there’s always room in my garage for a kayak with those qualities.